Massive stars end their lives in gigantic explosions, so called supernovae, and can become - for a short time - brighter than a whole galaxy, which is made up of billions of stars. Although supernovae have been studied theoretically by computer models for several decades, the physical processes happening during these blasts are so complex that until now astrophysicists could only simulate parts of the process and so far only in one or two dimensions. Researchers at the Max Planck Institute for Astrophysics in Garching have now carried out the first fully three-dimensional computer simulations of a core collapse supernova over a timescale of hours after the initiation of the blast. They thus could answer the question of how initial asymmetries, which emerge deep in the dense core during the very early stages of the explosion, fold themselves into inhomogeneities observable during the supernova blast. While the great energy of the outburst makes these stellar explosions visible far out into the Universe, they are relatively rare. In a galaxy of the size of our Milky Way, on average only one supernova will occur in 50 years. About twenty years ago, a supernova could be seen even with the naked eye: SN 1987A in the Tarantula Nebula in the Large Magellanic Cloud, our neighbouring galaxy. This relative closeness - "only" about 170,000 light years away - allowed many detailed observations in different wavelength bands over weeks and even months. SN 1987A turned out to be a core-collapse supernova, a so-called Type II event. It occurs when a massive star, which is at least nine times heavier than the sun, has burned almost all its fuel. The fusion engine in the centre of the star begins to stutter, triggering an internal collapse and thus a violent explosion of the entire star. In the case of SN 1987A the star had about 20 solar masses at its birth. SN 1987A is probably the best studied supernova and it is still a great challenge to develop and refine models of what was happening inside the dying star to produce its emission of radiation. One of the astonishing and unexpected discoveries in SN 1987A and many subsequent supernovae was the fact that nickel and iron - heavy elements that are formed near the centre of the explosion - are mixed outward in big clumps into the hydrogen shell of the disrupted star. Nickel bullets were observed to propagate at velocities of thousands of kilometres per second, much faster than the surrounding hydrogen and much faster than predicted by simple hydrodynamic calculations in one dimension (1D), i.e., only studying the radial profile from the centre outwards. The details of supernova explosions are very difficult to simulate, not only because of the complexity of the physical processes involved but also because of the duration and range of scales - from hundreds of metres near the centre to tens of millions of kilometres near the stellar surface - that need to be resolved in ultimately three-dimensional (3D) computer models. 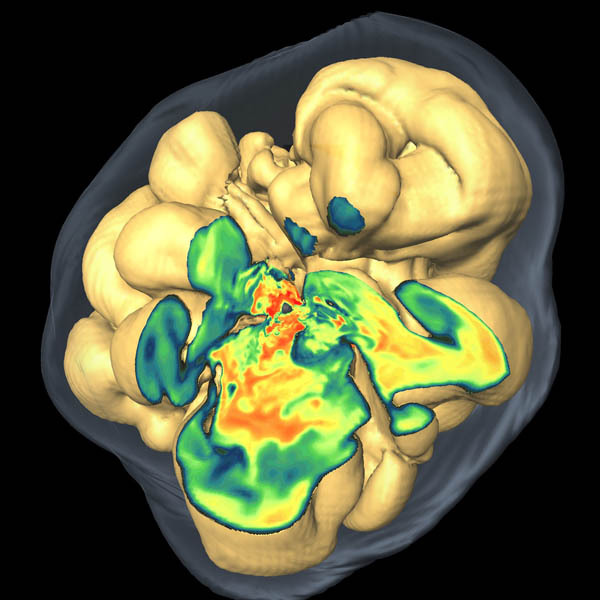 Previously conducted simulations in two dimensions (2D, i.e., with the assumption of axial symmetry) indeed showed that the spherical shell structure of the progenitor star is destroyed during the supernova blast and large-scale mixing takes place. But the real world is three-dimensional and not all observational aspects can be reproduced by 2D models. The new computer models of the team at the Max Planck Institute for Astrophysics can now for the first time simulate the complete burst in all three dimensions, from the first milliseconds after the explosion is triggered in the core to a time three hours later, when the shock breaks out of the progenitor star. "We found substantial deviations in our 3D models compared to previous work in 2D," says Nicolay Hammer, the lead author of the paper, "especially the growth of instabilities and the propagation of clumps differ. These are not just minor variations; this effect determines the long-time evolution and ultimately the extent of mixing and observable appearance of core-collapse supernovae." In the 3D-simulations, metal-rich clumps have much higher velocities than in the 2D case. These "bullets" expand much more rapidly, overtaking material from the outer layers. "With a simple analytic model we could demonstrate that the different geometry of the bullets, toroidal versus quasi-spherical, can explain the differences observed in our simulations," explains co-author Thomas Janka. "While we think that the differences between the 2D- and 3D-models that we found are probably generic, many features will depend strongly on the structure of the progenitor star, the overall energy and the initial asymmetry of the blast." "We hope that our models, in comparison to observations, will help us to understand how stellar explosions start and what causes them", adds Ewald Müller, the third author of the paper. Investigating a wider variety of progenitor stars and initial conditions will therefore be the focus of future simulation work. In particular, a detailed model that reproduces all observational features of SN 1987A still remains a challenge.